This weekend, nine Merchant Taylors’ Sixth Form students travelled to the USA to participate in the Model G20 Summit which is taking place in Boston this week. 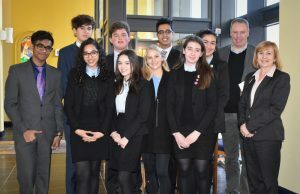 Molly Rigby, Ceci Power, Tala Bugis, Sophie Green, Khaira Ashcroft from the Senior Girls’ and Harry Scott, Aryan Patra, Mazin Karem and Zak Mansuri from the Senior Boys’. Click here to follow their trip via their G20 Blog. This is an amazing opportunity for the students involved and would not have been possible without the expertise of Chris Arnold, CEO of World Merit, who helped and supported our students’ applications for the G20 Summit. World Merit’s aim is to “award opportunities to those individuals who take action to make their local communities better. We connect passionate people with the skills and experience they need to prosper in a field that they identify with”. The Sixth Form students would also like to give thanks to the Merchant Taylors’ Old Girls’ and Old Boys’ Associations who have generously supported the opportunity by helping to fund the once in a life time trip. “The Model G20 Youth Leadership Summit is a five-day immersive learning experience designed to encourage high school students to develop skills critical to global leadership, diplomacy, and cross-cultural understanding. Devised by Knovva Academy in partnership with Harvard US-China Economic Interaction Council and GiantBug Foundation, the program provides students with an authentic simulation of a G20 Summit and is supported by a fully-developed global curriculum that leads up to the main event. Through the curriculum, students expand their knowledge of our global world and build the communication, strategic thinking, and leadership skills necessary to excel on the Summit floor. Here, students put everything into motion for a whole 360-degree approach to learning”. We hope that all the pupils thoroughly enjoy this amazing opportunity to connect with students from around the world and learn skills that will help further their careers in the future.